Beautifully designed for the kid who loves the finer things in life, these earrings are a must-have. With six stately clear cz's surrounding a real cultured pearl set in solid 100% 14k white gold, these earrings are the perfect compliment to a fancy dress, or a darling way to dress up her jeans. Your little princess will love how in these studs dazzle, a perfect treasure to add to her jewelry box. Presented in Tiny Blessing's signature gift wrapping makes your gift a meaningful and unforgettable one! I ordered these earring for my niece and when I received them I was ecstatic. They are beautiful and they match to previous bracelets I got for her. Love these earrings! They are gorgeous. Perfect for baptism. Screw back ensures we never lose an earring. Packaged nicely. Arrived quickly. Look great on my baby. I was looking for a pair of earrings for my 2 mouth old goddaughter. Upon searching the web i came across this site. I browsed through the items until finally found this pair of lovely earrings. Transaction was smooth delivery time was reasonable and the item itself was beautiful. Lovely packaging and information card about the item. 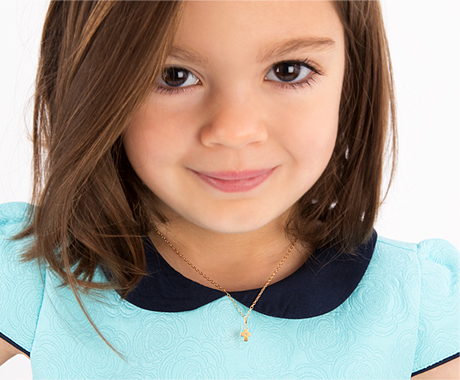 I’m glad I was able to find a jewelry site for kids that carries a nice variety of things to purchase. Beautiful, good quality earrings! Look exactly as pictured, perfect size for little girls ears! Shipped quickly and packaging is really nice, looks like a tiffanys box with white bow! These earrings are absolutely beautiful. We bought them for our daughters 1st birthday. They are perfect for her little ears. Everything about these are perfect for you littlest of girls. The dainty design, length of the stud, and security of the screw on back are all designed wonderfully for little girls. I give this pair a 4 because the pearl is not sitting the way it should on one earring. Not a big enough deal to send back or not wear. And the way it comes packaged is very authentic. Thanks for such a well made product. Bought these as a mother daughter gift for my god daughter and her mother...Reactions were priceless . The earrings were very elegant. A little smaller than anticipated but overall it was a great purchase. I'll definitely keep buying jewelry from here for my little girl. Very nice idea for a present. Who wouldn't like this beautiful and refined piece of jewelry! 14K white gold earrings are a must! The quality is as wonderful as the looks. Thank you for offering only the best quality for our little ones. Bought these earrings for my daughter's baptism. Beautiful earrings, good quality, love the safety backs!